I learned a new word this weekend: Busk. It means to perform or play music for money, usually on the street or in some other public, non-stage setting. I love live music and am also a pretty big fan of literacy for all, so I was excited to help out Literacy Network with their Busking for Books event this past Saturday. I’ve been meaning to make the time to volunteer with this organization for a long time, and this was the perfect opportunity. I was partnered with local band Zacataq (two guys named Zach), who were able to create book and literacy related songs on the spot. Talk about talent! Our little corner of the street ended up raising over $60 for Literacy Network. 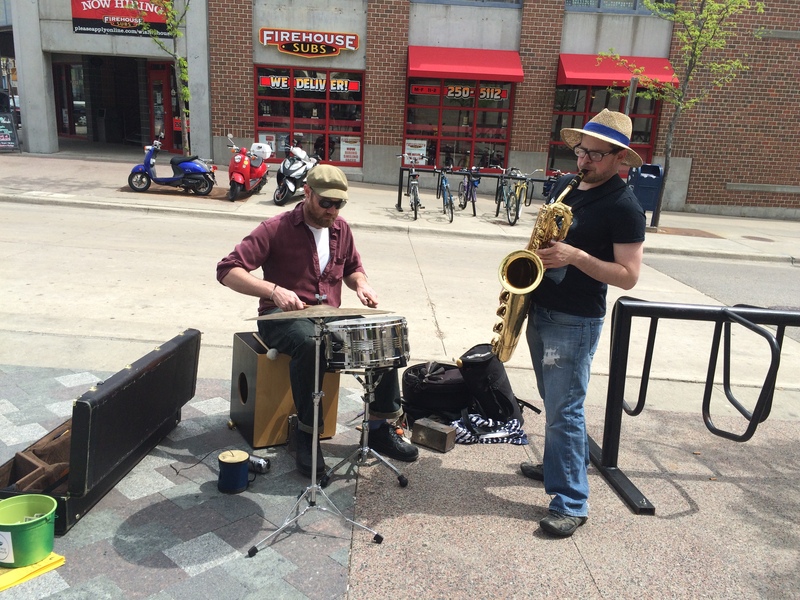 Afterwards, Hawk’s Bar & Grill provided appetizers for all the hungry, sunburned buskers and bucket wavers. Thanks, Hawk’s! Local Madison band Zacatac helping to raise money and awareness for Literacy Network. Photo by Holly Tierney-Bedord. All rights reserved. This is an annual event, so if you missed it, you’ll get another chance to join the fun next year!